Windows Updates have become quite weird. Microsoft has taken a lot of options for configuring Windows Updates from the users in Windows 10. For example, now there is no option to disable updates. Now it is mandatory to install updates. The users can “pause” the updates temporarily. One annoying activity of Windows updates is that users have to restart their system to complete the update process. If not configured properly, Windows will restart on its own scheduled times even without notifying the user. After the restart, sometimes Windows 10 takes a lot of time for updating the system. If you are in a hurry and want to restart the system without waiting for the updates to install, Microsoft does not give you any option. In this article, we will discuss about the solution to this very problem. After following this article, you will be able to bypass installation of pending updates on system shutdown/restart. If you click on the Power icon, you will get something like the above mentioned screenshot. 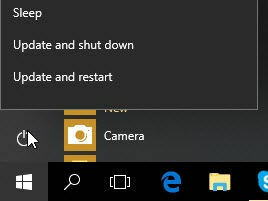 Windows will give you to update and shut down or update and restart. There is no option to shut down or restart without installing the updates. There is a simple trick to bypass this shutdown/restart process. Follow the instructions below to bypass the Windows updates installation process on system shutdown/restart. Sometimes Group Policy Editor (gpedit.msc) is a life saver in these types of situations. 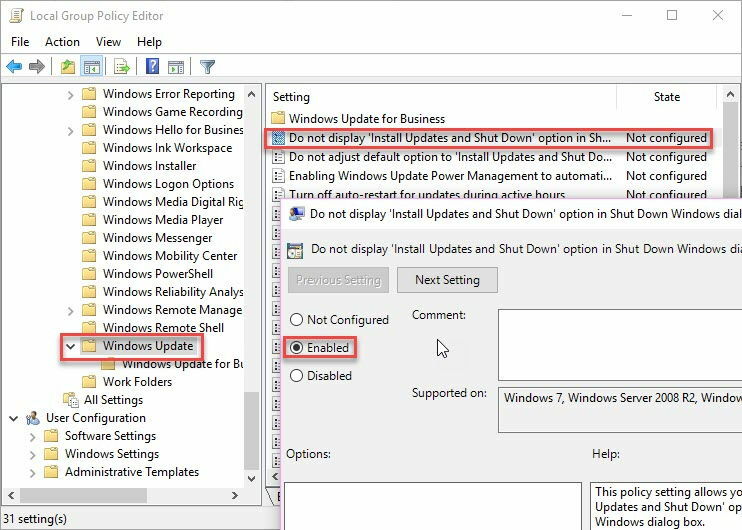 There is an option in Windows Group Policy “Do not display ‘Install Updates and Shut Down’ option in Shut Down Windows dialog box“. Enabling this option will make Install updates and shut down option disappear. The normal Shut down only option will appear. This is a permanent option. This means that the shut down and update or restart and update options will not appear in the Shut down dialog box. For installing update and restarting the computer, you will need to go to Settings –> Windows Update and select the install updates and restart from there. Computer Configuration –> Administrative Templates –>Windows Components –> Windows Update. If you want to bypass update on restart/shutdown process temporarily, you may do it using command line. This will stop the Windows Update service. This command will enable you to shut down or restart your system without installing Windows Updates. If you are still having issues with your Windows Update configuration, feel free to ask in the comments below. Thank you for your help! I’m trying to stop all the updates because lately they have been killing my touchscreen. I did system restore back to the point where I still had the drivers. Now to figure out why my HP printer keeps printing billions of copies of the first page of my documents. This is definitely not convenient! Thank you!